Info George Edward Herman - CBS News correspondent and host of the award-winning news show "Face the Nation" for just shy of 15 years. Herman was born on 1/14/1920 in Manhattan [Note: SSDI and the New York Times obituary give the DOB of 1/14/1920; Find-A-Grave.com prefers 1/13/1920]. He graduated from the Horace Mann School. He then graduated from Dartmouth with a major in math; while there, he won a prize for creative writing. He then graduated from the Graduate School at Columbia. Herman began his career as a journalist in 1942 when he took a position writing news stories for WQXR, a classical radio station in Manhattan. In 1944, Herman was hired to write news stories for CBS Radio and was soon hired as night editor. The following year, Herman went on air to announce the Japanese surrender and spoke without notes for 20 minutes while waiting for a senior correspondent to take his place. In 1948, Herman appeared on the CBS coverage of the Democratic National Convention, using a slide rule to demonstrate Truman's potential for winning the presidential nomination. The following year, Herman travelled to Asia and brought back the first sound and film reports from abroad. He was immediately assigned to cover the Korean conflict for CBS. He met his future wife while covering the White House for CBS in 1955. After President Kennedy's assassination, Herman reported from a post in front of the White House for 20 hours, reporting much of the time in the pouring rain. 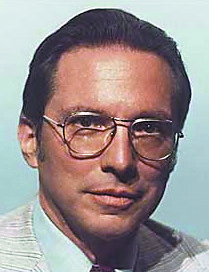 Herman's 15 year term as host of "Face the Nation" (1969-1983) was the longest of all hosts of the program. He interviewed hundreds of politicians and celebrities. The year 1972 was particularly important for Herman. First, he was the first to go on air reporting on the Watergate break-in. Second, Herman moderated the first McGovern-Humphrey presidential primary debate. Then later in the year he interviewed Senator Eagleton on "Face the Nation" in the ill-fated appearance that precipitated Eagleton's withdrawal from the vice presidential race. He interviewed the Ayatollah Khomeini in a cold house outside Paris just before Khomeini returned to Iran (1979). In 1986, when CBS planned to lay off Herman to cut costs, he asked to be officially fired. Herman died on 2/8/2005 in Washington DC. New York Times, 2/9/2005; Find-A-Grave.